Had a very productive morning, once I’d consumed the obligatory gallon of coffee. Shocked myself by actually paying money into my bank account – am surprised the computer system didn’t crash. 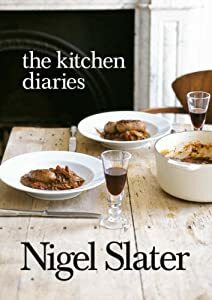 Then I went up to the sorting office to get my book, ‘The Kitchen Diaries‘ by Nigel Slater. I have to say that I’ve already read it from cover to cover, when I was away the other week but that hasn’t dampened my enthusiasm. I bought it from Amazon, and the seller stated that it was ‘new, unused, with light damage to the cover’. Well, the only damage I can see is some vague scratches on the front that can be spotted if I hold the book up to the light and squint. So, 5 stars to you, Bookworld of Bradford – I will definitely be buying from you again. Anyway, after picking up the parcel I did exactly as planned and walked down to Sharrow Vale Road, via the Co-operative Supermarket where I had a small cheese shopping binge – Parmesan Reggiano, which I needed, plus Gruyère and Manchego, which I didn’t, but I care not. Then I called in at the grocers, Sharrow Marrow, which is just the loveliest shop. I only went in to buy shallots and garlic, but came out with those two items plus a pomegranate, dried porcini, (grown and dried in Yorkshire, top marks), tomatoes, smoked garlic and ground coffee. I’ve decided against posting the ragoût recipe because there are so many already on the internet. I’m going to be cooking something from Claudia Roden‘s ‘Arabesque‘ later this week so I’ll post that instead. I’m now going to make myself another gallon of coffee and read my new book.